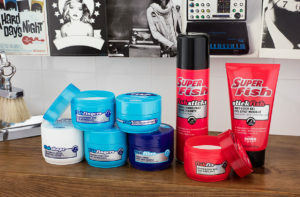 We are delighted to announce the acquisition of the men’s grooming brand ‘Fish’ to add to our brand portfolio. ’Fish’ is a well-established, authentic, contemporary brand with a ‘born in Soho’ positioning reflecting a close connection with London style trends through its link to the original Fish salon in D’Arblay Street. This heritage underpins a range of high performance men’s hair styling products which were launched more than 15 years ago and currently retail in Boots, Superdrug, Tesco and Waitrose and therefore have a strong complementary fit to the rest of our owned brand portfolio. All related trademarks have been acquired from Fish London Limited and stock, website domains, and other marketing collateral has been acquired from KMI Brands Limited. The brand will be managed here in Teddington and with our growing expertise in male grooming products where our portfolio of MR., The Real Shaving Company and Tru is seeing good growth. We see many opportunities to accelerate the growth of the brand in the UK and beyond both in terms of adding innovative new products to the brand and also broadening retail distribution. As we work to deliver these growth opportunities we are delighted to confirm that we have engaged the founder of the brand, Paul Burfoot, to work with us as a consultant. Paul continues to own and operate the iconic ‘Fish’ salon in Soho and is renowned for his innovative creativity as a trend setter in hair styling. His expertise and passion for style and product will help us drive and develop credible, ongoing innovation as well as taking an active role in supporting the digital and social media brand communication. Welcome to the team Fish, we are thrilled to have you on-board.